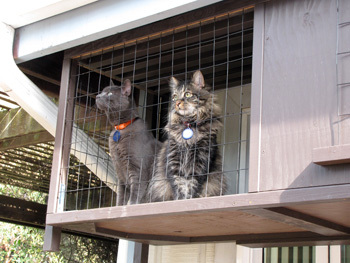 CatCluez: Rafter-mounted cat enclosure and "catzebo" let protected cats enjoy the outdoors, safely. Cats love high places. 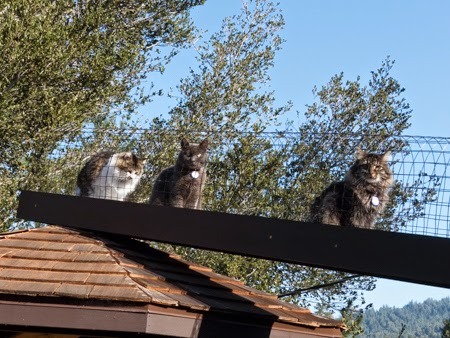 This project gave our three cats a lot more protected places to hang out and safely watch their world from several vantage points. Binky Inspects the new "rafter cage." This rafter-mounted cat-safe enclosure is constructed with 2 x 2 cedar and pine, and hung from the rafters under the eves of our house. 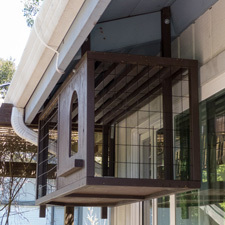 The bottom of the enclosure is about 78 inches off the deck outside the house so we can walk under it and still see out from inside the house. Rafter cage is hung with 3/8" lag bolts. In the window behind the enclosure, I have installed a DIY-modified cat-door designed for a sliding glass window. 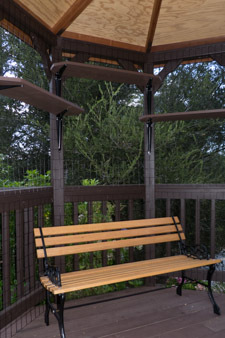 The rafter enclosure is 60 x 23 x 22 inches, is lined with 2-inch by 3-inch black-plastic-coated welded wire, and has a 1/2-inch plywood floor. Baxter and Brodie enjoy their new view of the world. There will be additional components added to this project as I expand our cats' domain, which is why there is an arched opening apparently leading to nowhere. 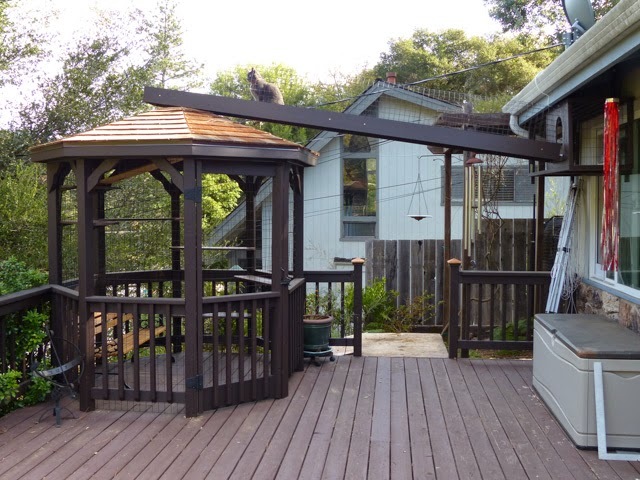 See below for image of the completed 12-foot mesh-enclose cat-walk "bridge" between the rafter enclosure and a 7-foot gazebo which has already been made cat-friendly and cat-safe with welded wire mesh and perching shelves. In the video above, we introduce our cats to their new real estate. Since completion of the rafter enclosure, they have been enjoying the extra space every day and evening, and new view of their world. 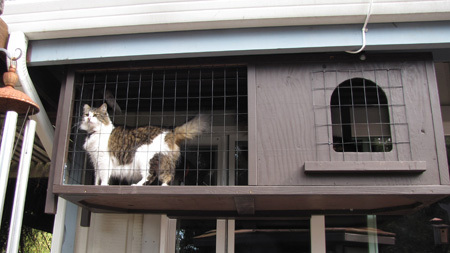 After the catwalk was constructed and installed, all our cats now enjoy extra space and things to do. The completed and installed catwalk.